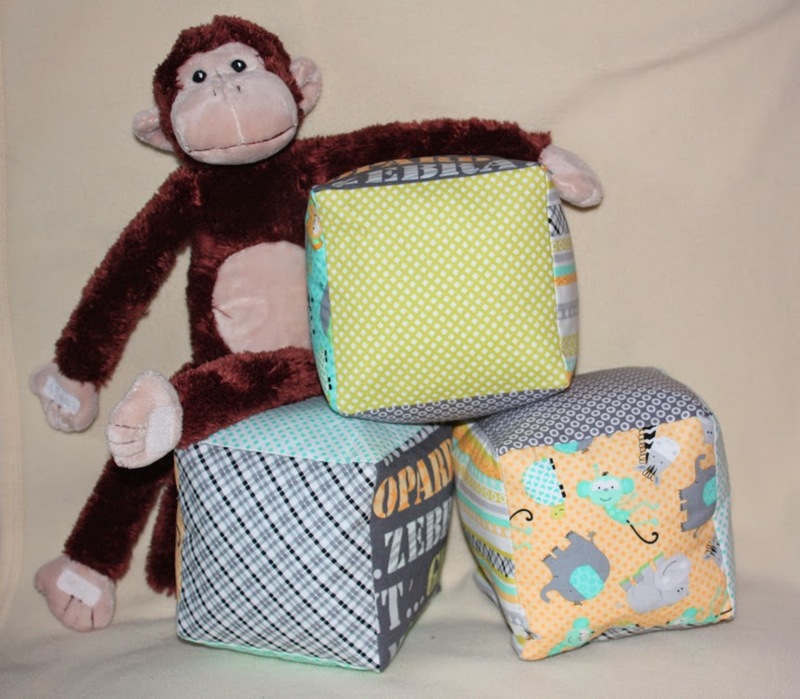 Up first are these adorable baby blocks, made using Kanvas' Safari Playground collection. Check out our tutorial, and then see how you can win some fabric yourself at the end of this post. 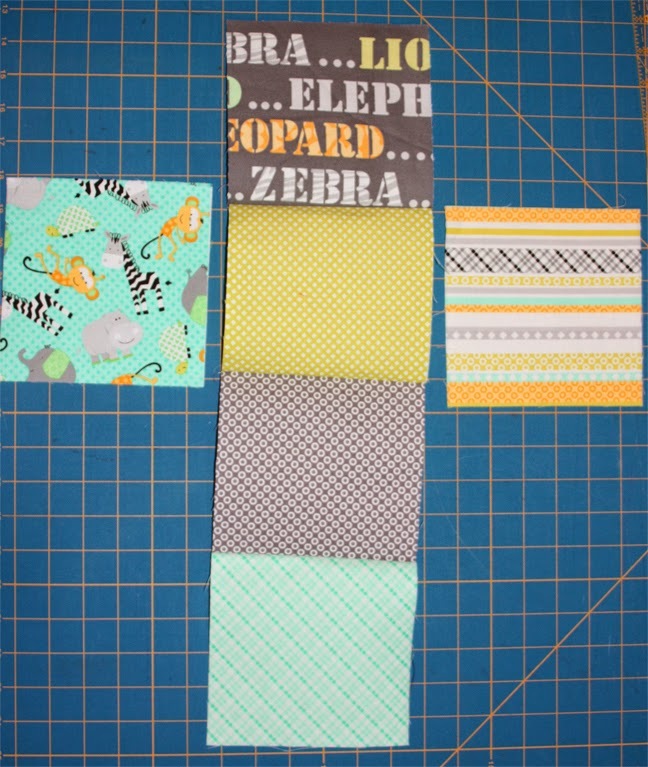 Here's a quick look at the Safari Playground prints--such a great palette--a breath of fresh air compared to the typical blue and pink baby options. Love all the textures in the coordinating prints! 1. 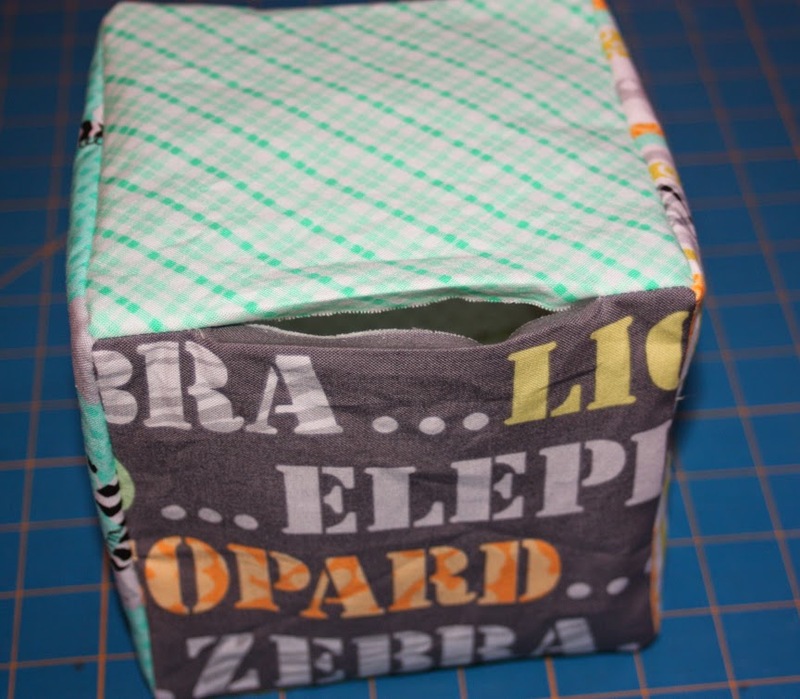 Following manufacturer's directions, fuse an interfacing square to the wrong side of each fabric square. By cutting them 1/8" smaller, you don't have to worry about the interfacing extending past the fabric edge if you don't line the interfacing and fabric up perfectly. Note: You can make the blocks without interfacing, but the little bit of stiffness it provides keeps the blocks from looking lumpy when stuffed. 2. 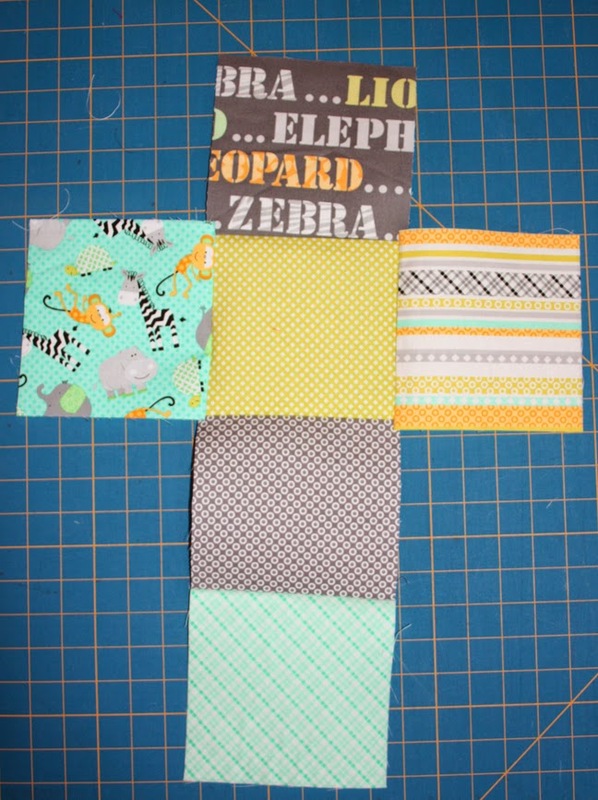 Lay out your fabric squares into a vertical row of 4 with the 2 remaining squares on the sides. 3. 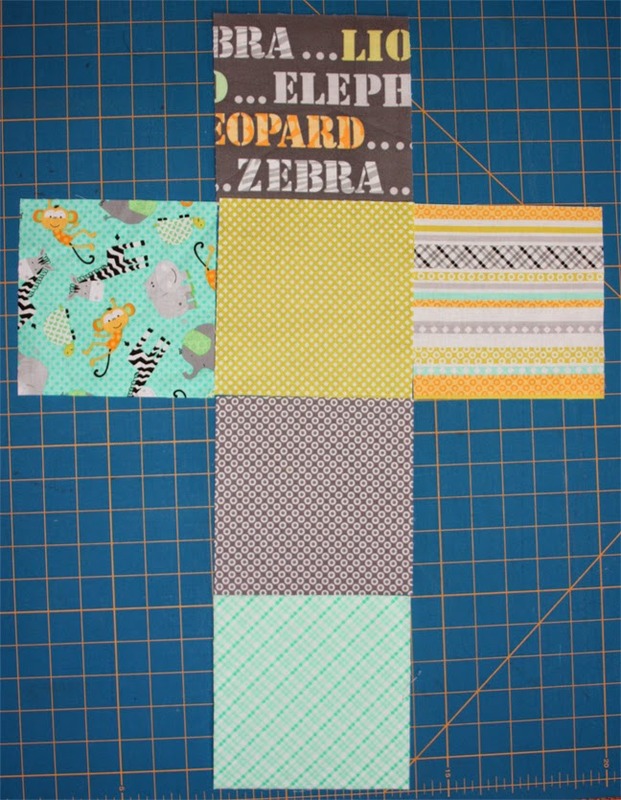 Sew the 4 vertical squares together, starting and stopping 1/4" from the edges. 4. Add the 2 squares to the sides, again starting and stopping 1/4" from the edges. Hint: Add these squares with the pieced row on top. You can use the existing stitching lines as guides for where to start and stop your next stitching lines (shown in the red circles). 5. 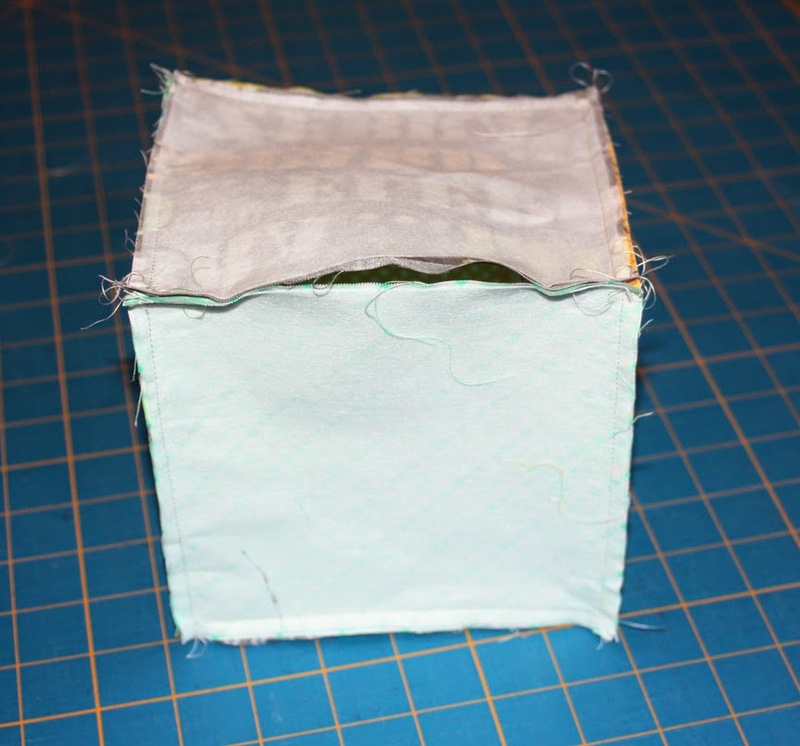 Fold the block right sides facing and begin sewing the remaining sides together. 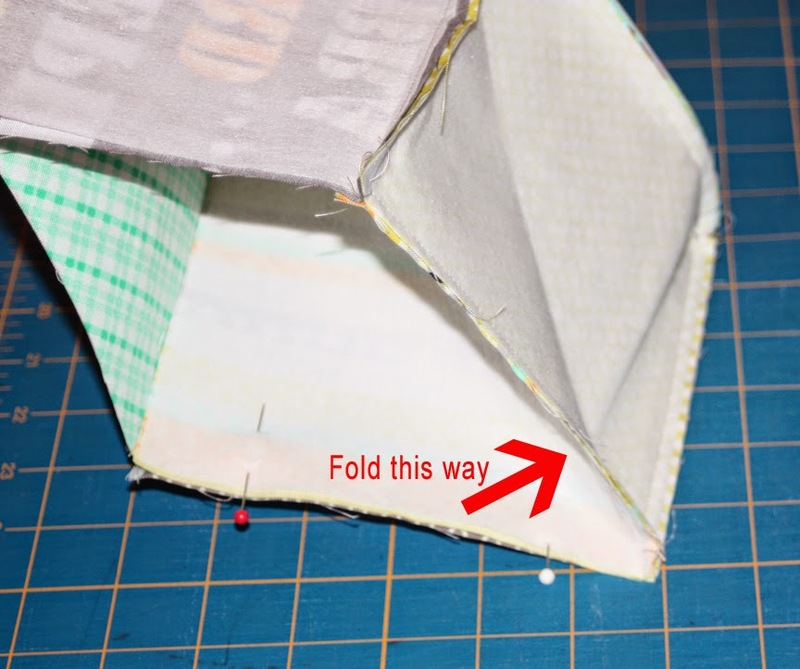 You can use the needle down and pivot approach at corners, but we found the following method easier: Pin together the 2 edges you'll be joining and then fold the side between them back onto itself (see photo below). With the block folded as shown in the previous photo, stitch along your pinned line. 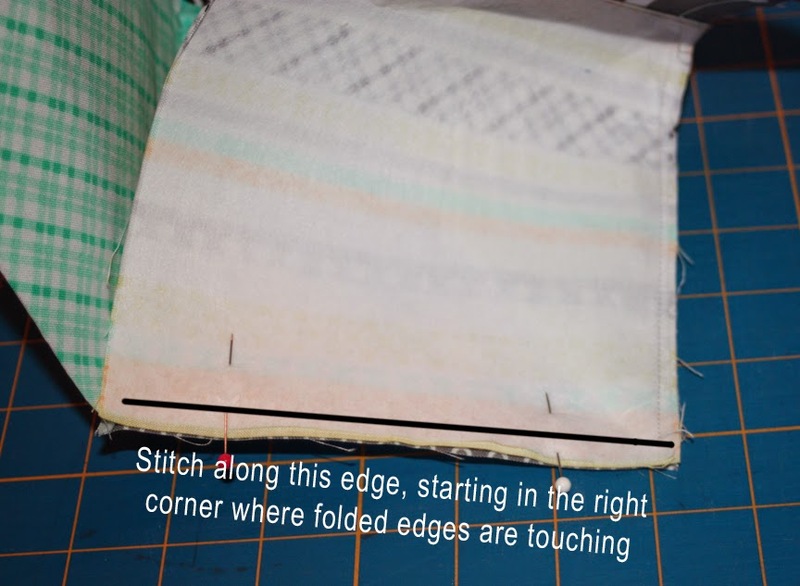 When you're starting at a 3-way corner like this, begin stitching at the fabric edge. This will create a sturdy corner. Stop sewing 1/4" from the opposite edge. 6. 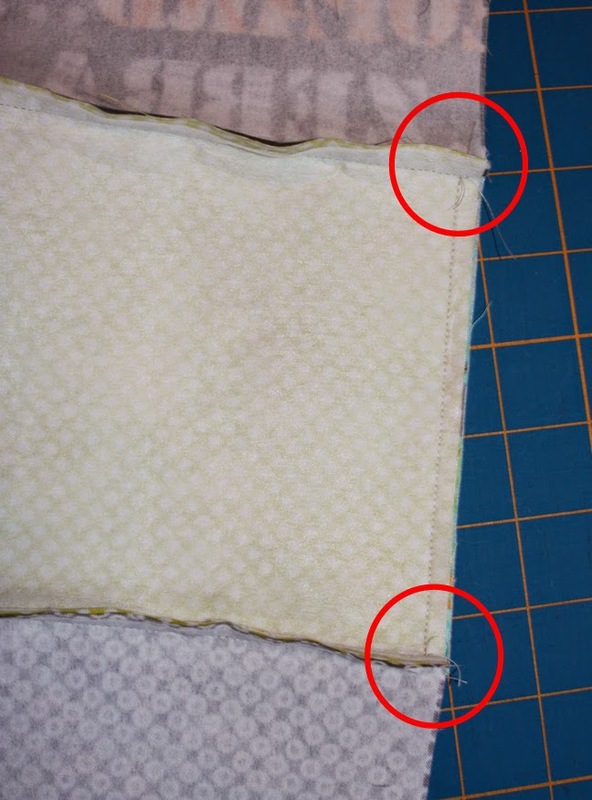 Continue sewing edges until you only have 1 open side left. Sew in from the corner on each edge, leaving a 4" opening for turning, and backstitching on both sides of the opening. Ideally you'll be able to fit your hand through the opening to help with poking corners out and stuffing. 7. Turn the block right side out and poke corners as needed. Press the raw edges of the opening in 1/4" to make hand stitching the opening closed later a little easier. 8. Stuff the block to desired firmness and hand stitch the opening closed. 9. Repeat to make as many blocks as you like! Voila! 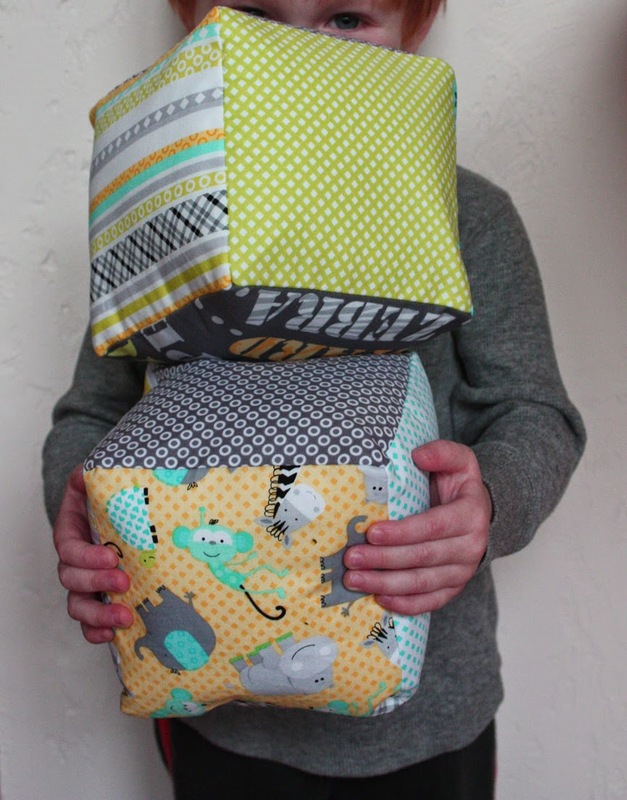 Easy stuffed stacking blocks for your favorite baby or toddler! 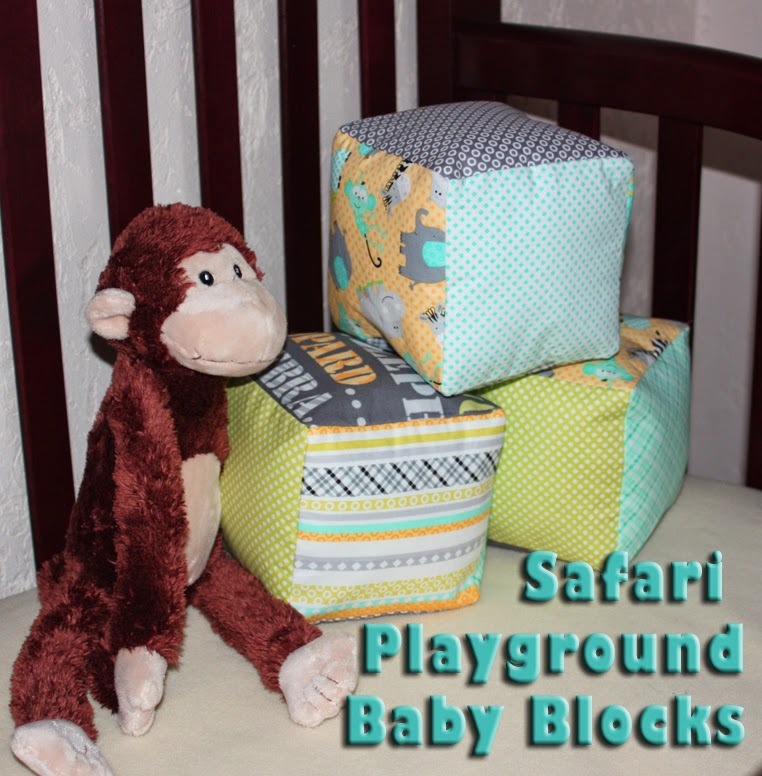 For a chance to win a fat quarter bundle of Safari Playground, make sure you're signed up to follow our blog either by email or through a blog reader (see both options in the right hand sidebar). 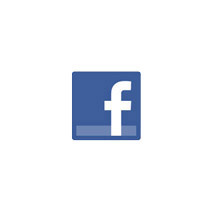 Leave a comment letting us know you are, and leave a second comment letting us know that you follow us on Facebook. In your comment, let us know if you're making any handmade gifts for the holidays this year (and if you are...where are you in the process? Idea stage? Halfway done? Already wrapped?). The giveaway will remain open through Tuesday, December 9th at 11:59 pm EST. I am making a Christmas Sleight Ride project for my Mom, Sister and 2 Nieces. I am currently working on the Starry Night Christmas Panel and will be working on a Christmas Greeting put into a frame for presents. I enjoy your tutorials. I find them very helpful in learning how to do a project. They are well written and you know that you can do this yourself. Thank you for the chance to win and looking forward to the rest of the following tutorials. I always have handmade gifts on hand for giving. It's pretty much a year round project. I follow via GFC. I follow through GFC. The handmade presents and decorations are pretty much done for this year unless I see something I just have to make, like those blocks, they're wonderful and I love the size. I have already made Christmas Stockings for everyone in the family (except for me!). I have made a few Origami Wreaths out of fabric and they are so sweet!! Next I need to make some table toppers... but I feel right on schedule this year! Whew!! I am following you on FB too! 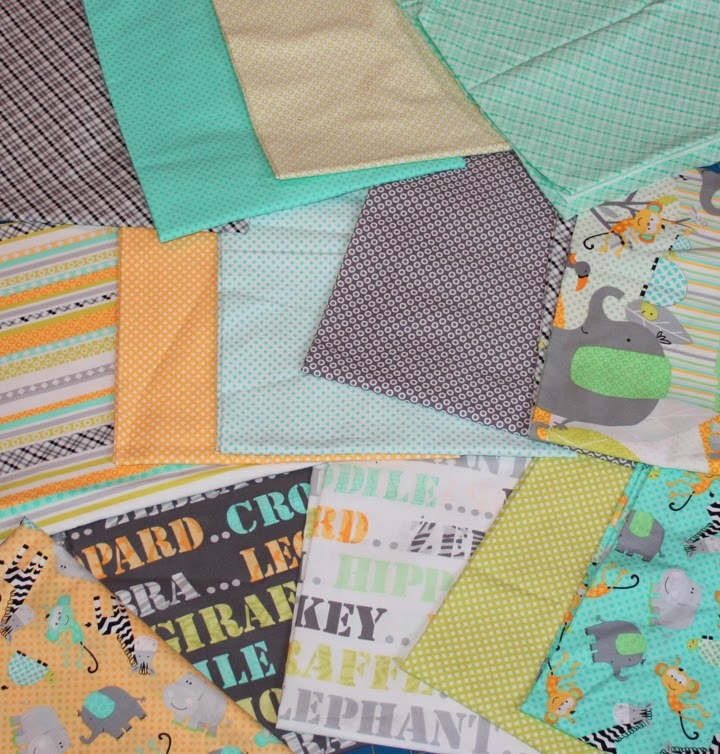 Than ks for the chance - this fabric is very sweet! I have 3 friends expecting babies and this fabric would be perfect for a quilt!! I'm almost done with all of the sewing except for a simple table runner. Yippee! Thanks for the giveaway! I follow on Bloglovin and GFC. Thanks again! I'm making aprons for my 4 sisters! Very cute line of fabric for a nursery. I am making several quilts as gifts this year. I follow you by email and by Facebook. STARTING 3 TREE ORNAMENTS;WOULD LIKE TO DO A TABLE TOPPER, OR MAYBE 2 ALSO! THANKS FOR A GREAT GIVEAWAY! I made a Grinch mug rug for an early Christmas present, but that's all I've done so far. I'm never going to get everything done ... again. I follow you on FB. I am currently working on pillow cases for Christmas. I make all my gifts, all the time. This year I made a couple of quilts with matching totes, covered journals, hot pads and wall hangings......I could go on and on. I am making lots of holiday gifts. Most of them are done, as I work on them all year. I follow via GFC and email. I follow with bloglovin. And I am sewing some sweet little bags to fill with goodies. I just have to handsew the bottom then they are finished. I follow you via email! I am shocked we are already in December. Plan to sew many gifts, but have started none! Thanks for the ideas! I have projects done, but not wrapped. Thanks for the tutorial! Love the bundle. The blocks are really cute--not only for kids to play with but for decorating as well. Thank you for your giveaway. I have finished making all my gifts and they are in the mail as we speak. I follow by Bloglovin. I also follow on Facebook. Thanks again for the giveaway. I have some homemade presents already made, wrapped and delivered but two important ones are still on the sewing table! I follow you via email. I am only making some food gifts this year. I made two flannel rag quilts for Christmas gifts this year. The are done and wrapped. I follow on Bloglovin. Thanks! I follow the blog with email and GFC. I have 2 zipper pouches to make. Cute. I love this collection. Great colors. I follow on Bloglovin and email. I have plans to make pajamas and a dress for my son, niece, nephews, and great niece. I'm hoping to make new Christmas stockings, and a throw quilt for my son. I follow via email. Yes, I'm making a quilt and pillow covers for Christmas. Thanks for the great tutorial and giveaway. Follow on bloglovin! No handmade gifts this year... Too many baby quilts that need to be made for friends this winter and spring! I am knitting 9 hats(6 done) and made a hand embroidered Dr Who quilt and gifted it already. I follow via Bloglovin' .. I am making a wrap bracelet to go with a traveling jewelry bag for a good friend. i do follow on facebook. i made and finished a rag quilt for my daughter in law. I follow you through email. Great tutorial for the blocks, I have admired them for a while but didn't know how to make them. I still have most of my handmade gifts in the planning stage, but fabrics are ready. I follow by email. Have a couple gifts done but several more to go. I follow you by email. The baby blocks went right on my to-do list since my daughter is due to have a little boy in May! I follow you on Facebook. I just added several new projects to my Christmas list today so I guess I'm about 1/3 done. Holy cow! Guess I better get a move on! I'm following you by email. I still have lots of sewing I want to finish before Christmas. I'm about 1/2 finished. Right now I'm working on some poinsettia Christmas ornaments to give to my family and friends. I follow on bloglovin (ebcallender). I make some handmade gifts, most are already done and ready to mail out. I do not have any hand made projects in the works. I try to sew gifts during the year instead. Thanks for the giveaway. I follow by email. I am working on Christmas gifts right now. Just finished making some pot holders and mug rugs for one of my gifts. Lots more to go. I am a Bloglovin' follower. I am mid-way in my hand-made gifts. A few are finished, but most are still in piles, waiting to be sewn. I will get it done! I receive your Email and follow on BL. Love the blocks. I am sewing pillows and bibs for gifts this year. I follow through bloglovin'. I'm making a tote for my daughter for her birthday, which is close to Christmas unfortunately. It's cut out and I'll work on it today after I finish decking the halls. Merry Christmas. I follow you on FaceBook. Thanks for the giveaway. Your blocks are very cute. About 80% finished. I made pillow covers for family. A Koozie and a small pouch for friends and coworkers. Just need to wrap 'em up. I follow via Bloglovin and now by email. Thank you so much for sharing the block tutorial and your generosity. I already follow you on FB - and I LOVE this project! I will make this for my granddaughter! I follow you on Facebook too. Yes, I am making many homemade gifts for Christmas this year. I'm at many stages in the process. Some gifts are totally done, while others are partially done. Thanks for the chance to win - I have a baby shower for a co-worker in January and these would be just perfect!!! I follow via bloglovin' and I have already sewn all of the Christmas presents, they are wrapped and are already mailed, since I live far away from my family. 3/4 done with stocking for my newest granddaughter. These are so sweet - great turorial :) I follow. I made an apron for a Christmas gift and have one more to make. I signed up for the email, but I don't do FB. For xmas I have a quilt in process and pillowcases yet to make. I was working on my submission for QuiltCon so I am behind on my xmas sewing. Those are very cute. I'm about halfway there with my projects. I follow Sew in Love. I follow via bloglovin. Thanks for the giveaway!! Follow with boglovin'! And yes....making family stockings and at least started we'll say! ;) Thanks! I have lots of babies to make for this year, these will be great! I follow with feedly. I am making some Christmas stockings - almost done ! I follow on Facebook and via email too. I'm making my first portrait quilt. It's of my dad when he was commissioned into WWII. It will go to either one of my children or my brother. I may have to make three of them. I have the picture traced and the fabric purchased. I had to repurchase fabric. Now I need to put the fusible on the back and start cutting and fusing and then quilt, etc. It will be a belated present as it will hang in a quilt presentation in early January. I am following your blog by email and am very excited about the small project tutorials you have. I follow you on facebook. I am making homemade gifts for Christmas. I am at the getting organized stage - I have the fabric - I have it sorted by project on my sewing table - I am just completing a table runner and then will get started on the remainer.